This Futuristic Style Pool Table is definitely one of a kind. 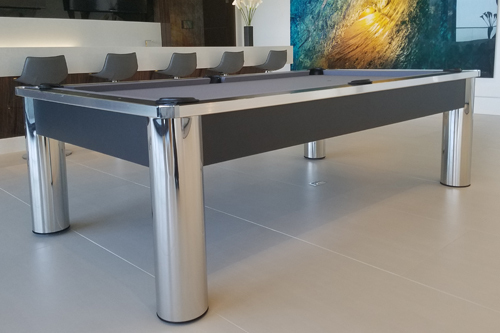 The Spectrum pool table is a marvel of contemporary style. The chrome and silver accents create a crisp clean style unlike any other table we offer. The massive oversized handrails securing full profile natural gum rubber K-66 master speed cushions assure excellent play to go along with an outrageous design. Finished in brush stainless steel. The Spectrum's modern design and sturdy construction has made it a very popular model.